Ubiquinol - 50 mg, 30 vegetarian softgels (Bluebonnet) - Penn Herb Co. Ltd. Aging, intense training and certain medications like statins compromise the levels and/or natural production of CoQ10 in the body, as well as the conversion of ubiquinone to ubiquinol. That’s specifically why athletes and seniors benefit from ubiquinol supplementation. 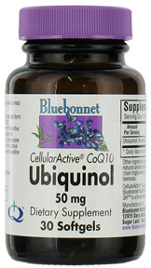 Bluebonnet’s CellularActive® CoQ10 Ubiquinol provide 50 mg of the “active” antioxidant form of CoQ10 (ubiquinol) rather than the popular, oxidized form (ubiquinone), which must be converted to ubiquinol in the body. Easy-to-swallow vegetarian softgels for maximum assimilation and absorption. AMOUNT PER SERVING (1 VEGETARIAN SOFTGEL): Ubiquinol (Kaneka QH®) 50 mg. OTHER INGREDIENTS: Medium chain triglycerides, soluble food starch, glycerin, sea vegetable extract, white beeswax, purified water, non-GMO sunflower lecithin, ascorbyl palmitate, lycopene (Lyc-O-Mato®) complex. Free of milk, egg, fish, crustacean shellfish, tree nuts, peanuts, wheat and soybeans. Also free of gluten, barley, rice, sodium and sugar. As a dietary supplement, take 1 vegetarian softgel, preferably with a meal or as directed by a healthcare practitioner.